Standing out on social media is a challenge for many business owners. But with Facebook’s ever-changing algorithm updates and dwindling user engagement on other platforms, it’s especially hard for e-commerce retailers. Fortunately, not everyone is struggling. In this article, I’ll show you nine brands that are successfully growing their sales with social media. Plus, what you can learn from them to achieve similar results. Online retailer Fabdog sells matching sets of human and dog pajamas. As one can imagine, their cute products make them an instant hit with dog owners. Their Facebook ads target users multiple times, meaning a user often sees it more than once before making a purchase. This reinforces the brand to consumers and makes it more familiar, and therefore more enticing. This is the mere-exposure effect in action. Using a video ad was another smart move by Fabdog. It’s proven that watching a video ad for longer than 10 seconds increases clicks by 20%. After 30 seconds, that goes up to a 30% increase in clicks. Video commands more attention than image ads. Fabdog’s adorable subject matter draws people in for at least several seconds, making video the perfect choice. Facebook’s carousel ads are perfect for e-commerce retailers. They let you display up to 10 product images in a single ad unit. Wayfair does this a little differently. Instead of describing the product shown, they list out benefits of shopping with them. For example, “Free shipping over $49,” “70% off sale,” etc. This informs the viewer about Wayfair as a whole, instead of just telling them about a few products. 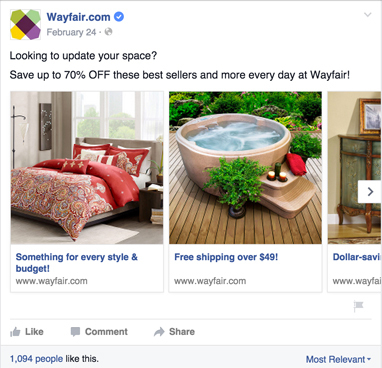 And it’s clearly working for them: Wayfair has achieved an 88% higher click-through rate and 20% lower cost per acquisition with these carousel ads versus standard single ads. FabFitFun uses shoppable pins to drive users straight to their website from Pinterest. When clicked, shoppable pins go directly to a URL. This one takes the user to this specific promotional landing page. FabFitFun also does a great job of partnering with influencers. When an influencer unboxes their delivery, they include an affiliate code that earns them commissions for referring others to FabFitFun. Due to their various social media advertising campaigns, FabFitFun has an average weekly follower growth rate of 1.03%, compared their competitors’ average of only 0.77%. They also earn an average weekly reach of 3.3 million people, compared to 1.7 million for their competitors. It’s no secret that Instagram users love fashion. In fact, one-third of Instagram users say they’ve purchased clothing after seeing it on Instagram. Dynamite uses the Stories feature on Instagram to share short video clips with their followers. They also include Insta-famous elements like swiping up to visit a product URL or voting in a poll. As a result, Dynamite’s followers grow by 1.37% per week on average, and they earn an average of 2,606 likes per post. Another powerful way to use Instagram for e-commerce is to run in-app shopping ads. When the user clicks on “Shop Now”, they’re instantly taken to the product page. They can buy without ever leaving Instagram. BabyLeggings showcases several product shots and sweetens the deal with a promo code offer. This is a powerful format for low price items as it makes it easy to encourage a spontaneous purchase, especially combined with a sale or promotion. Newegg runs a successful YouTube channel with original content on the latest tech product releases and industry news. This strategy works because Newegg knows what their customers want to see. The channel features a mix of live interviews from events like the Consumer Electronics Show and video reviews of new products. The videos sparked much discussion and healthy debate among customers that keep their brand top-of-mind. The videos encourage sales in an organic way, by providing value-first content that isn’t just a commercial for Newegg. In response to President Trump’s derogatory comments about several countries in January 2018, Airbnb launched their #WeAccept campaign. The campaign promoted tourism to the countries referred to in Trump’s comments. #WeAccept was the most-tweeted hashtag during the 2018 Super Bowl, earning over 33,000 tweets, 87 million impressions and mentions by over 60 global media outlets. Many brands stay away from bold or political statements for fear of alienating potential customers. In Airbnb’s case, their stance makes sense for their brand. The #WeAccept campaign aligns with their mission and values. It makes sense for Airbnb to have an opinion on Trump’s comments as a travel and tourism industry leader who believes in equality. Outdoor retailer REI did something other e-commerce brands thought was crazy. They shut down retail and online sales on the biggest shopping days of the year: Black Friday and Cyber Monday. REI’s #OptOutside campaign relied on the use of reverse psychology. Why would an e-commerce retailer shut down on the biggest e-commerce days of the year? The campaign wasn’t just a stunt. It made sense for their brand as an outdoor company. They want to get people enjoying the outside because that’s what they believe in. But, also because they want to sell those people the gear they’ll need to be outside. The campaign got them a lot of attention, even winning a prestigious Cannes Grand Prix award. #OptOutside earned 2.7 billion PR impressions and participation in the social campaign rose from 1.4 million in 2015 to 6 million people in 2016. In addition, traffic to REI’s website increased by 36% on Black Friday and 35% on Cyber Monday. Live video is a recent phenomenon for brands on social media, most often used for event coverage. Kohl’s did something different by hosting live workout classes on their Facebook page. Kohl’s chose January since it’s the most popular month for people to start working out. The live workouts drew in a dedicated audience and spurred sales of activewear at Kohl’s without being overly promotional. It’s not enough to share the same content across all your social channels. Make each social channel work for you. Creating innovative campaigns like these that leverage the strengths of each network can grow your sales. But before you can create a high-performing social media campaign, you first need to know what your ideal customers respond to. Like any other marketing strategy, knowing your target customer is key to success on social media, too. Which of the above social media strategies will you try? Leave a comment below. Emil Kristensen is the CMO and co-founder of Sleeknote: a company that helps e-commerce brands engage their site visitors with targeted on-site messages.